Designed for students at a beginning or intermediate language level, this program allows you to complete courses in Chinese language, international business electives in English, or both. Optional language classes employ instructional technology and practical scenarios, providing you with ample opportunities to practice your conversational skills. Business and language courses are highly interactive to immerse you in the local community. 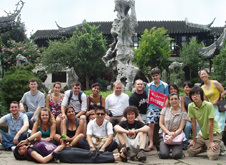 You'll participate in dynamic cultural and course-related activities that further enhance your understanding of Chinese culture and the crucial global business concepts present within this flourishing city. Shanghai's ancient past is tucked just under the surface of its iconic, modern skyline. As a leading port town and China's "Gateway to the West," Shanghai is considered a golden land of opportunity by many 21st Century Chinese. Its young, trendsetting population is known for a fascination with everything hip and ultra-modern, but the city's colonial influences aren't hard to find; just explore its many green spaces, park bridges, and interlocking canals to catch a glimpse into Shanghai's rich history. Shanghai provides a front-row seat from which to observe – and participate in – the shaping of China's dynamic future. Once based primarily on fishing and textiles, today the city's booming economy flourishes as gateway of commerce between East and West, as well as an international finance industry hub. Get to know China's culture and heritage through hands-on CEA activities like practicing early morning t'ai chi alongside locals, participating in a tea ceremony, sampling Hu Cai cuisine, or trying your hand at calligraphy.